Where to use money to Grow your Blog? There are thousands of blogs becoming live everyday. Money is a key factor to succeed in any business. If you want to create blogging as your full time business, you would definitely have to invest a good amount of money into it. If you are going to make a blog for a long time and you are not in hurry to make it an online business. You can work on it continously with a low investment amount. However, if you need to start your full time business with a blog. You will have to spend some bucks for it. Today, we will discuss those points where you should invest your money correctly. Many people spend thousands of bucks but they dont get results. It is crucial to understand where to invest your hard earned money. Let’s discuss about them. It is the first step in your blogging career to choose a suitable domain and hosting plan. There are many hosting plans available in the market according to customer’s need. For a new started blog, it is better to buy a starter package. As you will increase the traffic and content, you can upgrade to further bigger plans. Nontheless, If you will buy some bigger plans in starting with low traffic. It is just a waste of money. Beware of unwanted ads who are trying to steal your pocket. Bluehost is the best domain and hosting provider for all the new bloggers. It has many great plans best suitable for beginners. As you all might be familiar with WordPress. It is the best CMS platform for bloggers. You can always get thosuands of free and paid WordPress themes. Theme is the layout of your website. You need to make sure to amaze your blog visitors all the time. It is truly crucial to create an amazing theme for your blog. There are 2 ways to set your blog design. Either you can buy a premium WordPress theme from the market or you can hire some developer to create a custom theme. However, hiring a developer would be more costly. That’s why you should buy some responsive theme from the market. It is a good option for tight budget bloggers. Writing good content is the most essential part of a successful blogger. If you have a lot of time to create your content, you shouldn’t have any issues. But if you dont have enough time write a blog post every day or week. You might lose your ranking on Google. If you have a good budget for your next successful biz. You should surely invest to hire some content writers. It is specially for those who are trying to get your blogging business on track in a short time period. Investing on some good content writers would give you more time think about your business goals. You will get good results in a short span of time. Guest post is an easy way to get backlinks. However, you need to approach 100s of people to accept your guest post request. Some give it for money and some also provide a backlink for free. Backlinks are the most significant factor to get organic traffic. Google search engines are ways ready to rank your website. For that, you need to show them some trust flow and authority of your website. As many backlinks you will get, you can surely increase Googke ranking of your site pages. It is crucial for every blogger to create quality backlinks. However, it is not an easy task to create backlinks. There are thousands of ways to create backlinks to your blog. All those are very time consuming. If you have a good budget, you should hire some SEO agency for that. They will create regular backlinks to your website. This will boost your site ranking in Google search results very fast. I have seen many blogs who has only few articles and pages on their website. But they have thousands of backlinks and they are coming on first page of Google for many keywords. More specifically, always try to hire some good SEO agency for all this backlink work. Do not try to trust on backlink sellers in the market. For instance, Fiverr is the worst place to buy backlinks. 99% of them are not going to give you quality backlinks. So try to hire some trusted agency. After all these investmenets. I don’t think you need to invest anymore anywhere. Blogging is sloww process and it can’t make thousands of dollars from just 1st day. You need to work on it regularly. Do not waste you money anywhere to increase your blog. You need to work on it constantly and you will see the results soon. Even if you dont have that much money to invest on writers or SEO agencies. You can still get succeed but it will take a little bit more time. You need to write content by yourself continously. 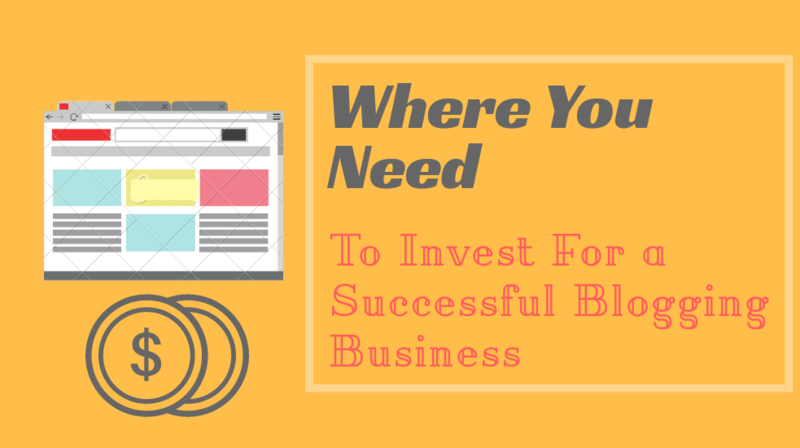 There are many places where you need to invest money to make your blogging successful. However, there are many scams where you can lose your money too. Beware of fraudulents before buying anything irrelevant. For instance, many people sell fake traffic to get increasing nunbers in analytics. Although this kind of traffic always generated by bots. This methods can never increase your Google ranking and your business. Many people also sell bulk backlinks on my different platforms like Fiverr. There will be no benefit of these junk backlinks. These links can never give you any link juice to enhance your ranking. You need to be rely on all white hat techniques to create a sustainable business. It is most important to invest money in your blog but you also need to keep away from scammers. This way you can hurt your blog ranking and image in front of Google. Make sure to try most significant factors to increase your blog. Blogging is a long journey and you need to keep patience for it. I hope this post would be helpful for all the bloggers. If you have any suggesions or comments. Please feel free to comment below.